Experimental psychology can teach us lots of non-obvious and important things about the criminal justice system, and here they all are in one really great read. Dan Simon not only elegantly summarizes hundreds of studies but makes them vivid. In Doubt is a triumph of broad knowledge, good sense, and great literary skill. What an incredible work! It's insightful, thoughtful, and remarkably rich and complete in its compilation of the research. This will be an essential book for anyone working in this field. Simon has pulled off an impressive intellectual feat: a synthesis of ideas that points the way to critical legal reforms at the same time that it advances scholarly understanding of cognition. We can learn a lot from his book - both about how the mind works and about how the criminal justice system can be made to work better. Dan Simon has a superb command of the research in cognitive science, and how it affects the very real world of the criminal justice process. In Doubt shows how universal fallacies in reasoning and blind spots in perception and memory can send innocent people to prison and let guilty ones walk free, and promotes reforms to make the system more truly just. 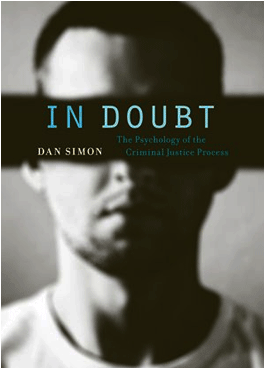 In this important book, Dan Simon appraises a now-sizeable body of evidence that our criminal justice procedures are highly prone to serious error. This isn't an ideological indictment; Simon's book ought to disturb the conscience of anyone who believes that truth should matter in a just society. In this unique and timely book, Dan Simon brings together an enormous body of social science research to argue compellingly that even when everyone is acting in good faith, we cannot count on the accuracy of witnesses, confessions, police and prosecutorial charging decisions, jury verdicts, and appellate court decisions. At each step of the criminal justice process, common errors in perception, memory, and judgment, often caused by unrecognized bias, can distort legal outcomes. Everyone involved in the criminal justice system should absorb In Doubt's disquieting message and its prescriptions for minimizing accidental injustices. In the past few decades, DNA evidence has starkly revealed how prone to error our criminal justice system can be, even in seemingly 'air-tight' cases. Now Dan Simon has brought the latest in psychological research to bear in order to explain some of the root causes of these disturbing failures and to point the way to solutions. This book is, by turns, terrifying, learned, and persuasive-sure to be of interest to scholars, policy-makers, and anyone concerned about the reliability of our criminal processes.